The keys to Jack Dorsey's retirement fund? 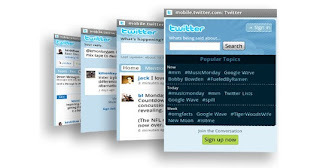 "...we’re updating Twitter for mobile web (mobile.twitter.com) in an effort to give every person on the planet a consistent Twitter experience." MobilePhonesFan sees this as a smart move. Concerns over high data rates and what phone makers call 'convenience factors' (e.g. : long battery life, tough and reliable handsets with readily available, inexpensive spare parts) are a big part of why many emerging markets show slow take-up of online social services. Most feature phones can overcome those objections. Pointedly, Twitter's revised mobile app is claimed to use one-third less bandwidth. This new-found electromagnetic thrift helps make Twitter "... the most accessible way to connect with the world, even with the weakest signals and the simplest devices." Perfect for tweet-starved folks in India or Indonesia. Or Derbyshire. Or Mississippi. Not coincidentally, there's new life in this part of the mobile market. Nokia, for one, seems to be making a renewed push into featurephones. The Finnish company claims to make phones that cost less and yet 'do' more, offering up their handsome new Asha Touch line as example. True, they sure don't look like inexpensive phones. And yet they are, with prices ranging from €59 to €89 -- roughly $80 to $115. Gone are the days when 'featurephone' implied a 'T9' or QWERTY keypad. These new Asha models are full touchscreen phones, reflecting Nokia's position that, by 2015, 40% of featurephones will be touchscreen devices. 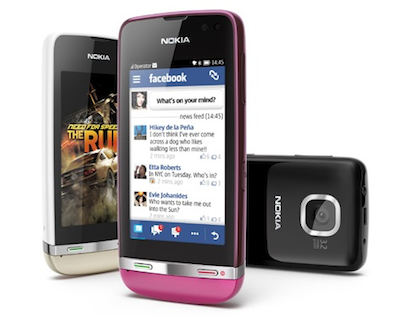 The Asha line also bears a familial resemblance to Nokia's Lumia 610 ...at €189 (~$237), their low end Windows Phone. 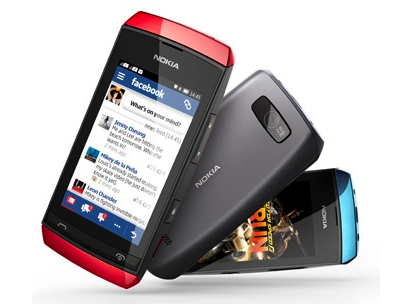 If a similar looking smartphone is seen as aspirational, that would raise the Asha's profile. "By introducing the Asha Touch phones to the market, we're accelerating our commitment to connect the next billion consumers. These phones deliver on what young, urban people value most -- a great-looking device; and an intuitive and affordable experience for connecting to the internet, to their friends, and to a world of entertainment, web apps and content." But there's another reason for Nokia's shift toward inexpensive touchscreen devices. Their traditional dominance in the low-end has been undermined. Increasingly, buyers are opting for low-cost Android smartphones instead of featurephones ...for more than a decade, the part of Nokia's catalog with the highest customer loyalty. Worse, thanks to slow sales of their Lumia (Windows Phone) line, Nokia is now finding their product-mix suddenly bottom-heavy. In a world market that's rapidly shifting to smartphones, over 80% of Nokia's revenue comes from feature phones. It's because of this imbalance that Nokia lost the #1 phone maker crown to Samsung, last quarter. It doesn't hurt that Twitter (and others) see their future in mobile devices. 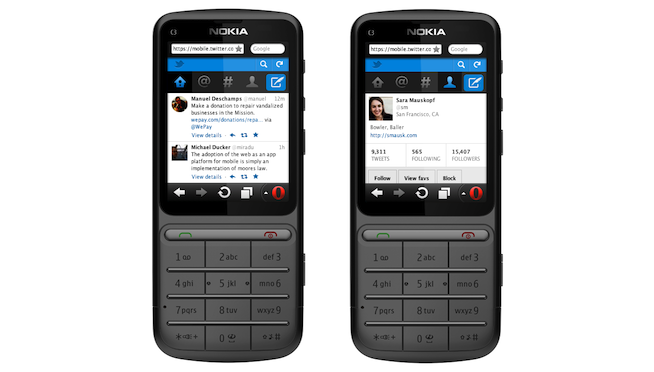 Better-designed Web apps means even small, low-cost phones can provide a good user experience. Even the White House seems to be helping Nokia's cause. Last month, President Obama called on all US federal agencies to optimize their websites and critical services for mobile devices, with an initial review in just 90 days. Who knows? With so much help from app developers, Nokia could yet turn things around.